Successfully Added Car DVR Dash Cam - Anti-Radar Detector, GPS Navigation, Android OS, Quad-Core CPU, 7 Inch Display, WiFi, 1/2.5 Inch CMOS to your Shopping Cart. So much more than a regular car DVR kit, this dash cam comes with an Android OS and highly accurate GPS navigation features – making it the perfect in-car gadget for any vehicle out there. Thanks to its 5MP lens that packs a 1/2.5-Inch CMOS sensor, this car DVR system is capable of producing HD footage of all that’s happening in front of your car. Never again will you be bothered by false insurance claims, as this dash camera will capture even the smallest movements. On its 7 Inch display, it allows you to instantly watch back previous recordings – letting you solve minor disputes at the side of the road without needing to involve law enforcement. Thanks to its Android OS, this car media play brings along hours worth of fun and entertainment for all your passengers. Google Play provides access to more than a million free to download media files. Movies, games, and Applications – with this Android car media player your kids will never have to feel bored again while waiting to reach the upcoming destination. Featuring a powerful 800mAh battery, this dash cam is capable of operating up to 2 hours continuously without an external power supply. Thanks to this, your kids will be able to hold it in the back of the car and play their games without distracting you while driving the car. 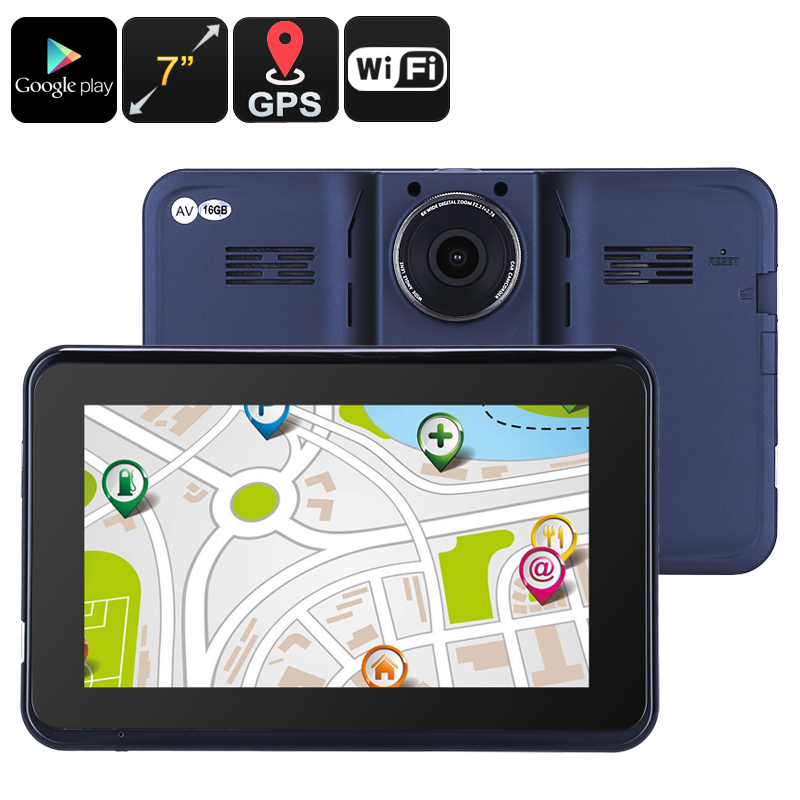 Featuring a powerful Quad-Core CPU that reaches clock speeds up to 1.34GHz, this Android Car DVR system is capable of meeting all your media, recording, and navigation demands without dropping a frame. Talking about the latter, this car DVR kit supports a highly accurate 64 channel GPS navigation feature – ensuring that you’ll never get lost again. With access to the latest traffic information, this navigation system will make sure that you’ll always arrive in the fastest and most efficient manner – taking away all those in car annoyances of getting lost while traveling abroad. Packing 16GB of internal storage and a 64GB SD card slot, this Android car media player lets you store plenty of the latest games, movies, applications – as well as DVR recordings and navigation maps without needing to worry about storage space. Whether you use it for its car DVR security features, the navigation system, or for in-car entertainment – this amazing car black box is the perfect upgrade to any vehicle out there. This dash cam comes with a 12 months warranty, brought to you by the leader in electronic devices as well as wholesale electronic gadgets..
Arabic, Croatian, Czech, Danish, Dutch, English, Finnish, French, German, Greek, Hebrew, Hungarian, Italian, Japanese, Korean, Latvian, Malay, Norwegian, Persian, Polish, Portuguese, Romanian,Russian, Slovak, Spanish, Swedish, Turkish, Chinese (Simplified), Chinese (Traditional), Korea, Japanese.